Dendrobaena octaedra is a small, litter dwelling earthworm native to Europe that has invaded areas of Canada, United States, South America and Asia. The combined impacts of this species and other exotic earthworms are having profound effects on forest ecosystems in North America, particularly in regions which lack native earthworms. Exotic earthworms rapidly consume leaf litter, thereby altering nutrient cycling and availability and other soil properties. This has cascading effects on microbial communities, invertebrates, vertebrates and seedling establishment, and may alter entire plant communities and threaten rare plant species. Dendrobaena octaedra is a small (2-4 cm) litter dwelling (epigeic) earthworm (Scheu & Parkinson, 1994). 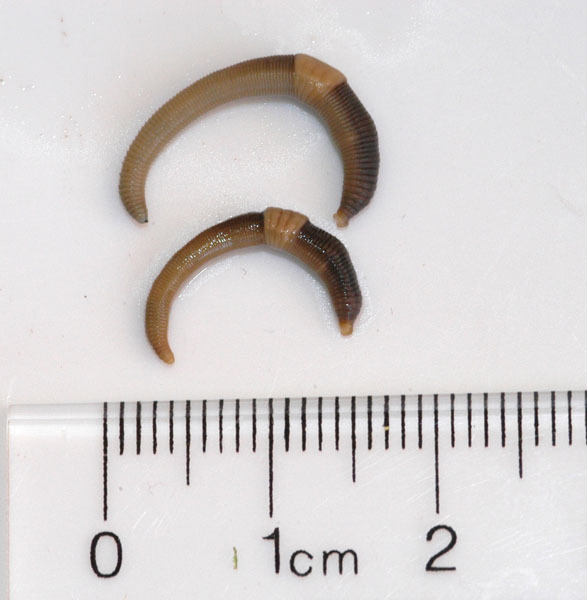 It has a mean biomass of 0.13 g (Wironen & Moore, 2006) and is highly pigmented, a characteristic feature of epigeic earthworms (Hendrix & Bohlen, 2002). D. octaedra shows extensive morphological variability in its introduced North American range, and wide variability in somatic and reproductive characters in its native northern Europe range. Adults may lack or possess rudimentary male pore terminalia (Terhivuo & Saura, 2006). Dendrobaena octaedra can turn to wintering at any ontogenic stage. For the whole “egg to egg” cycle to occur in one season, the soil temperatures must remain above 20 °C for four to five months. Thus the complete cycle may not occur within one season (Berman et al., 2001). In agricultural systems and natural systems adapted to earthworms, they provide important ecological services including improvement of soil properties (e.g. nutrient turnover, soil structure and water flow, pH, functional biodiversity, food sources for vertebrate predators) and increasing plant production. Indeed earthworms have been deliberately introduced to pastures, landfills and reclaimed mite sites in several countries around the world to improve agricultural productivity and minimise soil degradation (Baker et al., 2006). Dendrobaena octaedra is common in coniferous forests in its native European and introduced North American range (Addison, 2009). It also grows and reproduces well in litter with a high content of oak (Addison & Holmes, 1996 in Addison, 2009). It is an epigeic species, preferentially inhabiting organic layers of the soil (Dymond et al., 1997). It is extremely frost tolerant and can withstand freezing in all stages of development (Berman et al., 2001; Tiunov et al., 2006). D. octaedra is also acid tolerant, although juveniles taken from soil of pH 2.9 exhibited lower growth and survivorship than those from soil of pH 5.7 (Carcamo et al., 1998 in Addison, 2009). Dendrobaena octaedra reproduces via apomictic parthenogenesis, in which eggs are produced by mitosis rather than meiosis. Offspring are thus genetic copies of their parent, and a single individual is capable of establishing an invasive population (Cameron et al., 2008). Parthenogenic species are capable of rapid adaptation, as large numbers of offspring can be produced, some of which are likely to have beneficial mutations (Simon et al., 2002 in Cameron et al., 2008). Eggs are produced within cocoons which are highly frost tolerant and are presumably a key factor for successful colonization of temperate regions (Dymock et al., 1997; Berman et al., 2001). D. octaedra can produce very high densities of cocoons; up to 3692/m2 have been recorded in Canadian Rocky Mountains, Alberta (Dymock et al., 1997). Dendrobaena octaedra is an epigeic species. It inhabits the litter layer, feeding primarily on microorganisms associated with decaying surface litter (Hale et al., 2008). Epigeic species facilitate the breakdown and mineralisation of surface litter (Hendrix & Bohlen, 2002). Recommended citation: Global Invasive Species Database (2019) Species profile: Dendrobaena octaedra. Downloaded from http://www.iucngisd.org/gisd/species.php?sc=1710 on 19-04-2019. Informations on Dendrobaena octaedra has been recorded for the following locations. Click on the name for additional informations.